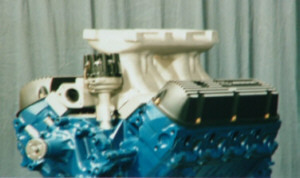 The 351 Windsor engine continues to grow in popularity. With easy access to the crate engines and the availability of a variety of Windsor heads, the engine just keeps on being one of the best street engines available. Of course, lets not forget racing!!!!!!! The AP-01 is for the cast iron head and any OEM replacement head. The AP-04 is for the taller aftermarket ports. The AP-04TH is used when you have a tall port (2.1) Like the Victor Jr. or Canfield and you want to use something that was meant to be for OEM designed a few years ago. Chances are that there wouldn�t be enough material to port it out all the way, so PME designed this plate .220 to help raise up the OEM intake into a place it could do the most good. 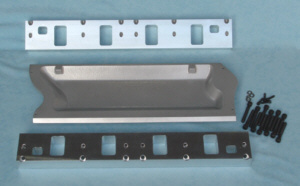 PME is used to customizing the ports to fit the particular cylinder head that you have purchased. There are certain dimensions that are always asked. Measure starting at left side of head. Also need to know the distance from bottom of head to valve cover rail.